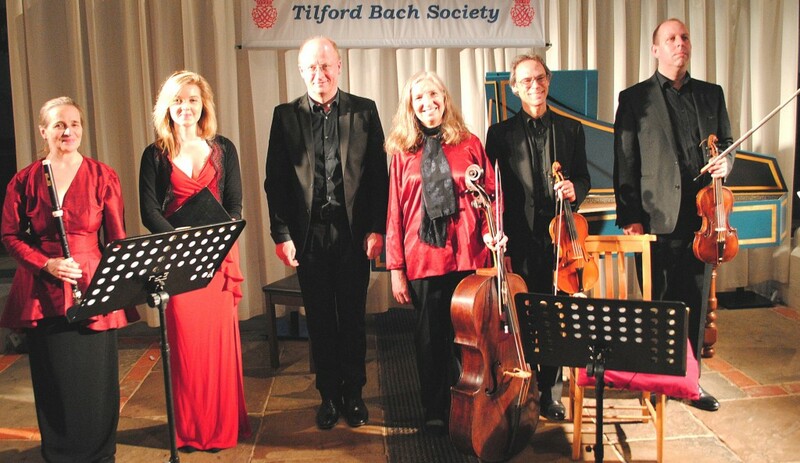 If a composer’s reputation during his lifetime translated into his eventual musical status in later centuries, the Tilford Bach Society might well now be called the Tilford Telemann Society. Georg Philipp Telemann became a musical giant during his life. He was a very prolific composer who was driven by his love of music and composing, capable of playing a wide range of instruments, and achieving this against the express wishes of his parents who did everything in their power to turn him towards a sensible career in law. 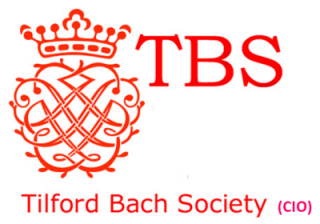 Given that both Bach and Handel looked up to Telemann during their overlapping lives, it is natural that the aficionados of JS Bach in the TBS should take a strong interest in Telemann, and the first main concert of the festival this year focused on Telemann in this 250th anniversary of his death. 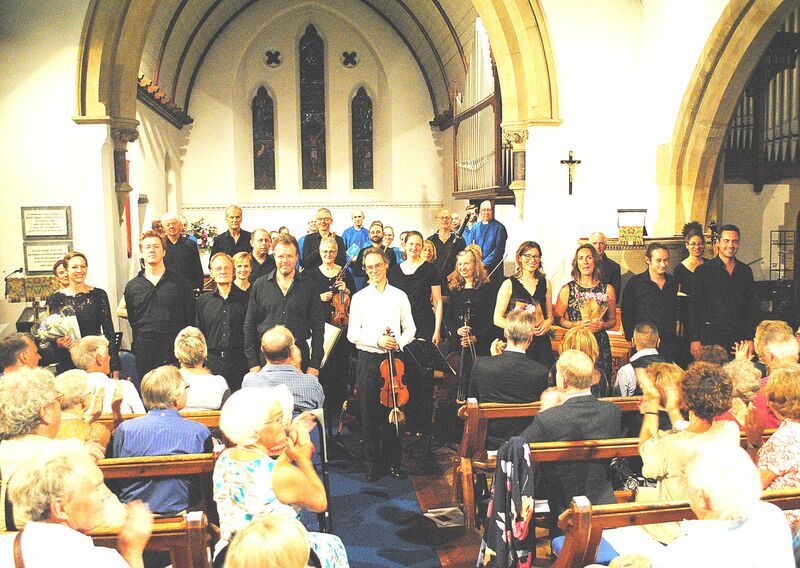 The London Handel Players, comprising the regular favourites under the leadership of Adrian Butterfield, presented four Telemann pieces, a Handel cantata and a Bach Canatata with the visiting soloist soprano Rowan Pierce. This was a concert of greater variety than might be supposed. There were two Telemann “Paris Quartets”. The second one (No 6 in E minor) comprised movements that evoked images of dancing. The Handel Cantata Un’alma innamorata was a song telling a tale of both love that is wounded and the joy of loving more than one heart. In her first appearance of the evening, Rowan Pierce delighted the audience with her interpretation of this piece. This was followed by a Telemann concerto for recorder, two violins and continuo. With the formidable talent of Rachel Brown on the recorder and the equivalent skills of Adrian Butterfield and Oliver Webber on the violins, this was a piece that greatly pleased the large audience. After the break, the concert delivered the Bach Cantata Tritt auf die Glaubensbahn, the second Paris Quartet mentioned above and the Telemann Cantata Vandelt in der Liebe, bringing the entire company together in a suitable conclusion…except there was a little more. 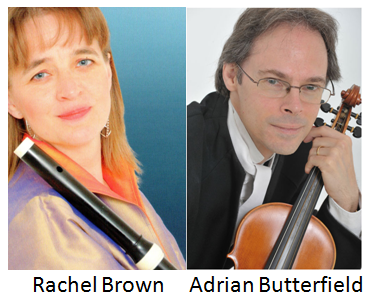 Adrian Butterfield told the audience how Telemann was admired by GF Handel and the company played a piece that so strongly resembled the Telemann piece that you felt Handel might have been in court facing charges of plagiarism in a different era. 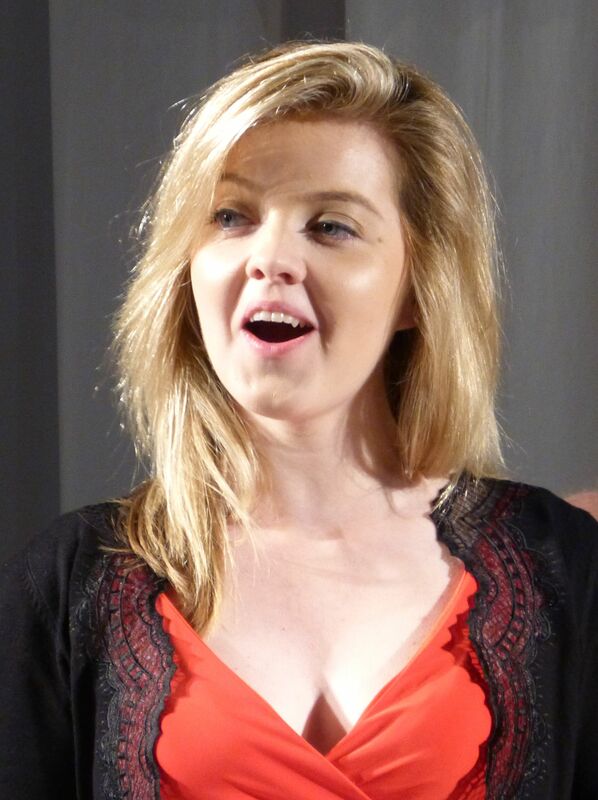 The performance of this concert by one of Farnham’s favourite professional musician ensembles was, as always, faultless and the audience was particularly pleased to make the acquaintance of an excellent soprano in Rowan Pierce. The climax of this year’s Tilford Bach Festival was a performance of Bach’s St John Passion which had been performed at the very first Festival 65 years ago. It was a fitting tribute to founder Denys Darlow who would doubtless have been delighted by the superb quality of the performance and the fact that it reproduced as closely as possible the way this great work would have sounded in Leipzig on Good Friday 1724. Denys’s aim was always to make performances as authentic as possible, but in 1952 it was only feasible to supplement the modern orchestral instruments with one or two Baroque ones, such as the viola da gamba and the viola d’amore. Now the London Handel Orchestra, masterfully directed from the violin by Adrian Butterfield, consists entirely of Baroque instruments and the choruses were sung by the eight soloists as was evidently the practice in Bach’s own church. Choristers of St Thomas on the Bourne supplemented the soloists in the chorales and the audience joined in for two of them. From the arresting opening—eight professional soloists singing in chorus can certainly make a powerful sound in a small church!—it was evident that this was going to be a memorable experience. The soloists’ roles are demanding, both singing the contemplative arias and portraying various characters in the drama of the Passion. Peter Harvey was deeply moving as Jesus and Tim Meade excelled in the beautiful aria ‘It is fulfilled’ which moves from simple serenity to dramatic triumph. But it was tenor Charles Daniels as the Evangelist who held the stage throughout, telling the story with such passion that it was as though we were hearing it for the first time. I don’t think anyone present will ever forget the moment after Peter’s third denial when he ‘went out and wept most bitterly’ in a prolonged howl of anguish that was truly heartrending. After the final powerfully affirmative choral, there was a short silence before the audience roared its approval of this exceptionally great performance of a truly great work.